Just as you perform routine maintenance on your car, your plumbing system should be inspected on a regular basis to keep it running it's best and identify any potential issues to help avoid costly emergency repairs. We're happy to lend our expertise to help protect your investment! We post Plumbing and Home Maintenance Tips on our Facebook Page every Tuesday. Click the Facebook Icon to visit our page and please be sure to "LIKE US"! 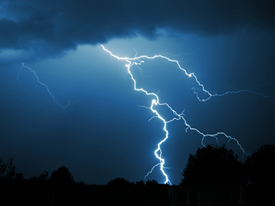 Heavy rains can mean flooding so don't wait until it's too late to protect your property. Have your sump pumps and ejector pumps routinely checked to ensure they are fully functional at all times. If you have an older pump or are unsure of it's age, we recommend that you replace it. We strongly encourage home-owners to invest in a battery back-up system that will power your pump in the event of a power outage. A water back-up means property damage, loss of valuables, time and money spent repairing after the fact. If you already have a back-up system, make sure that it is inspected and fully operational and that the battery is in good working order. If you have a marine battery, make sure the proper amount of water is in the battery and it is at its proper level. Many of these units fail because there is no water in the battery. You can also change your existing battery and install a gel battery which requires no maintenance. Plumbing fixtures come in varying metals, faucet types, and control options, so much so that the choices can be overwhelming. Here are tips to choose plumbing fixtures that will enhance the style of your home, increase the value and best meet your needs! Style matters: Whether your kitchen or bath is traditional or ultra modern, your plumbing fixtures should take cues from the decor. For rooms that have ornamentation, and traditional lines consider using fixtures which have similar details. For minimalist detailing choose simple and clean lines in your fixtures. Strong horizontals and chrome or nickel metals are synonymous with modern styling.Many plumbing fixture manufacturers group their products into designer lines that will help you pair up fixture with your current sink, bath or shower. Use pre-matched inspiration ideas to show you what plumbing fixtures would look best in your space. Assess your lifestyle: Every home has different wear and tear based on its family members and where the fixture is located. 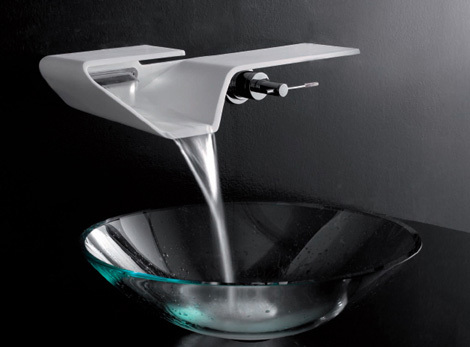 Most kitchen faucets receive more use than a tub or shower fixture. If you have a lot of dirty hands that will constantly be touching the kitchen faucet, consider getting one with hands free or one touch controls. If your home is going to be the subject of a lot of entertaining than opting for a wow factor fixture with high polished metal or a dramatic silhouette may be perfect for your space. Know your budget: Plumbing fixtures are one part of home improvements that you donï¿½t think about until you have to. Look online or in magazines to see what inspires you and then shop around for prices and If you are on a tight budget, see if there are wholesale plumbing fixture dealers or warehouses in your area. If you are selling your home consider upgrading your plumbing fixtures if they are outdated as this will make your renovation dollars go further. For more information, please visit our PRODUCTS page or call us to schedule an on-site consultation. We, Power Plumbing are continuing to try and help future customers as well as existing customers. In cold weather, many homes of new construction as well as bad plumbing on install of water supplies hot and cold in exterior walls rather then up through floor for toilets on outside wall and lavatory sink. Turn the heat to 65 degrees and leave cabinet doors open where water lines, (pipes), are present. Run a very light stream of water through pipes, this makes it very hard for water to freeze due to movement. Make sure your drain can handle the water flow before leaving fixtures run. 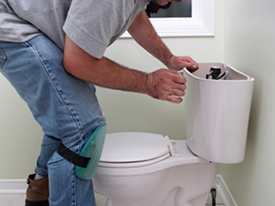 Toilets are harder to keep water running through them, we recommend on lifting the tank flapper up slightly for water to run through toilet, this can be done by removing tank lid and flushing toilet then keep tank flapper from sealing the tank so water will continue to flow on toilets, make sure your fixture can handle the water flow. 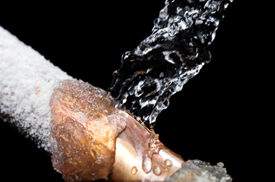 In certain conditions it is wise to call a licensed plumber for problems with freezing lines. Save water by fixing a leaky toilet. Leaks inside your toilet can waste up to 200 gallons of water per day and can be difficult to detect with the naked eye. To find a leak, add a few drops of food coloring to your toilet tank and wait a few minutes, don't flush. If color appears in the bowl then you have a leak and repairs should be made. Normally, leaks are caused by a bad flapper valve, flapper valve seat, ballcock valve, improperly positioned float arm or a defective overflow tube. Want more information or to schedule an on-site inspection of your systems? Please feel free to call us at 773-248-9574. Join the Power Plumbing Chicago email list today!